I've been hearing about the Human Nature line of products for quite some time now. The manufacturer's name, Gandang Kalikasan is roughly translated as beauty from nature since all products are made from natural ingredients found in herbs, flowers, plants, and other items concocted from nature. The company also promise that all products are biodegradable and 95% relatively safe. They are also sourcing most materials used through local fair trades in rural and urban communities instead of purchasing from major manufacturing corporations. One of our mainstay writers, Jess, have also featured several Human Nature items in her posts such as this - A Review of Affordable Beauty Products that Effectively Eliminate Chicken Pox Scars, Acne or Pimple Marks and Dark Spots. In that post, she had encouraged the use of two products (which are also in my list) for scars, marks, and dark spots. 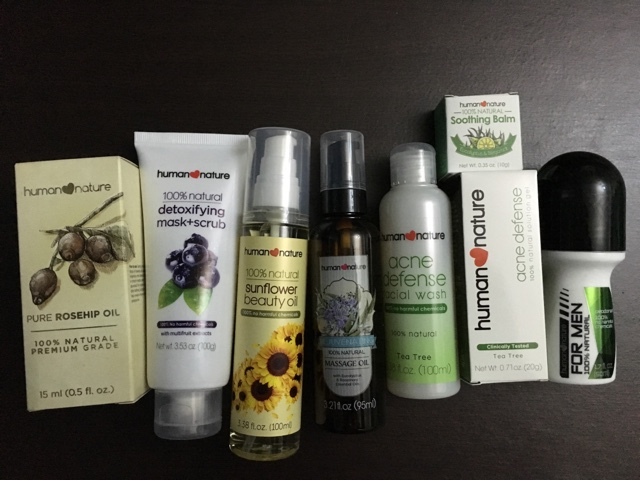 So when I finally got to drop by a local Human Nature branch within the same city where I live, I scoured the shop for specific products. I already have items in mind before I dropped by. I wished I purchased more but my basket already had over 2k worth of products back then if I am not mistaken. Other than the shops, you may also buy online and just pay for the shipping fee through their website http://humanheartnature.com/buy. Shipping is free for purchases worth over 2,000 pesos. This is one of the items mentioned in the post above which help ease the effects of certain types of scars (acne, wound), pimple marks, stretch marks, dark spots, and other types of blemishes. It is also the most expensive in this list at 712.50 pesos for 15ml. It may last for months at least if you are applying it to a limited area once a day only. Mine lasted for less than a month, I think because I used it sparingly several times per day. Rosehip oil is supposedly helpful when it comes to easing (not completely eliminating) skin problems above. To use, apply a liberal portion (four drops will do in most cases) and massage it onto the skin until it is absorbed. It's best applied after taking a bath and left on for 30 minutes or longer (overnight if you can tolerate it). Exfoliate weekly in order to reveal an improved skin without going through harsh peeling. Speaking of exfoliation, this mask/scrub product is a good option. It can be used as a mask which you can apply dry and leave on for 30 minutes at least or use it as a scrub as well. I've read reviews about some women leaving it overnight but it's a bit messy to do that though. It is made from strawberry seeds, bamboo granules, kaolin clay, multi-fruit extracts that are designed to deeply cleanse pores, purify and renew skin as well as minimize excessive oil. It exfoliates and washes away dead skin for a more refined and brighter skin. During my first use (as a scrub), the gentle yet super clean feeling after feel reminded me of Glamglow Supermud Clearing Treatment. Sunflower oil is a less expensive option compared with Rosehip oil. It contains vitamins A, D, and E.
On the Human Nature website, a long list of usage is available for this item. Some of such uses include for moisturizing, lightening or whitening, softening, makeup removal, relief from itching as well as sunburn, hair shine, and more. But it's lightening effect on dark spots, pimple marks, and scars like the Rosehip oil which makes it standout. This is a good alternative to acne products with harsh ingredients. It is made from tea tree with aloe vera and is alcohol-free. The gel (not on the image above) can also work like spot correctors which you can apply specifically at pimples to dry them out. While there are other products on the image (and also not pictured) that are worth reviewing, these are the ones I have personally tried. Aside from beauty products (face & skincare), other products sold include bath & body (hair, body cleansers, feminine care, body care, hand & foot), items for the family (care for baby/pet/men, against the sun, oral, hand & foot), wellness or home care, food & drink, and gift items. For more information on all product listings, prices, and branches, visit their official website www.humanheartnature.com/buy .